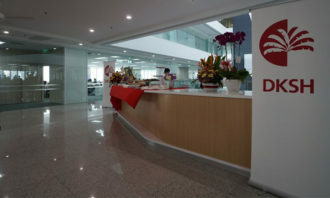 The latest Links International’s 2018 Asia Salary Snapshot has reported more than one-third (36%) of employers in Singapore cite a 3-6% salary increase. On the other hand, 32% of them cite a 0-3% salary increase, followed by 19% citing a 6-10% of salary increase, with 9% saying 0% increase and 4% agreeing to a salary increase of more than 10%. 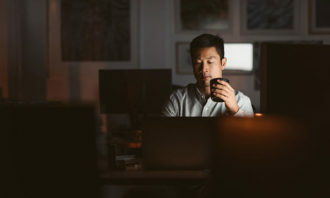 However, despite 73% of employers being open to counter-offering a resigning employee, only 38% of employees who accepted counter-offers have stayed for more than 12 months. Furthermore, the survey revealed that slightly less candidates are itching to move with 43% citing they’re “likely to move – showing a drop from last year (49%). 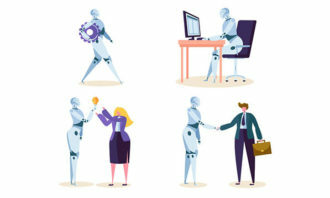 On that note, the survey also reported that career progression was the most influential factor when it comes to job moves for Singapore professionals. This is followed by salary, and then leadership. In comparison, Hong Kong professionals cite salary as the top factor in job moves, followed by career progression and work/life balance. According to the report, hiring within the HR space was much slower in the early part of 2017. However, there was a significant increase in Q3 and Q4 in HR hires at the mid to senior management level. 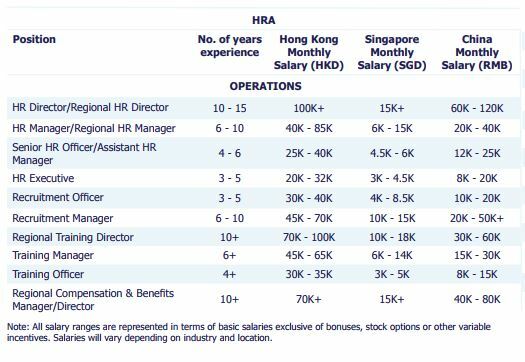 HR directors in Singapore with 10-15 years of experience can expect a monthly salary of over S$15k. In comparison, those in Hong Kong can earn over HKD$100k per month. 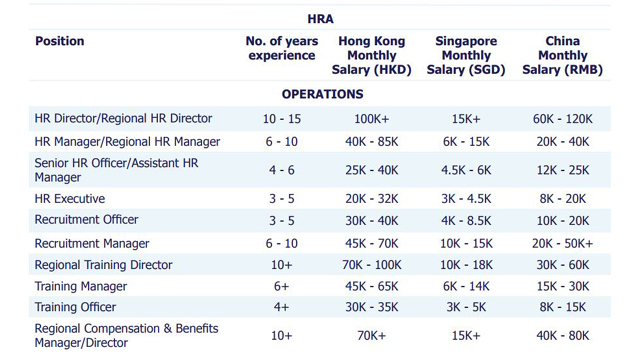 Similarly, regional C&B directors with more than 10 years of experience may earn over $15k in Singapore, while regional organisational development directors may earn more than $16k per month in Singapore. 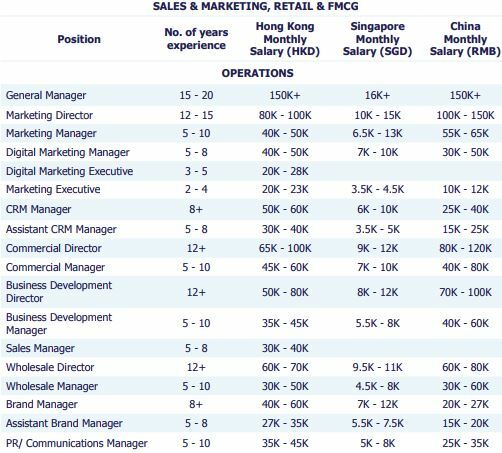 In the sales and marketing sector, marketing directors in Singapore with 12-15 years of experience may earn $10k – $15k per month. 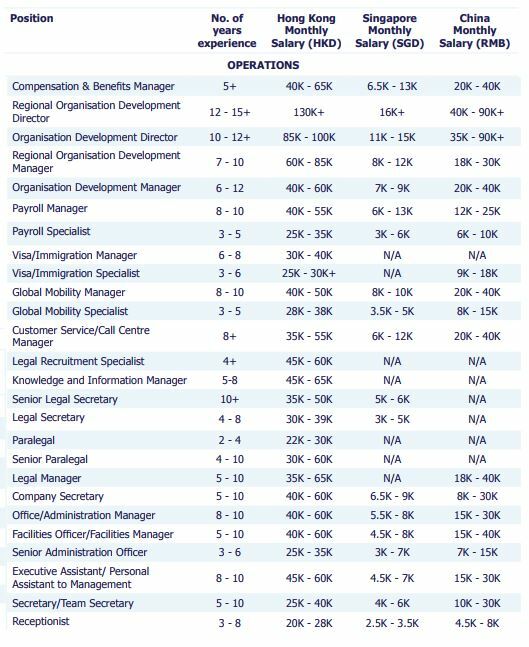 Meanwhile, business development directors in Singapore with over 12 years of experience may earn $8k-$12k per month.